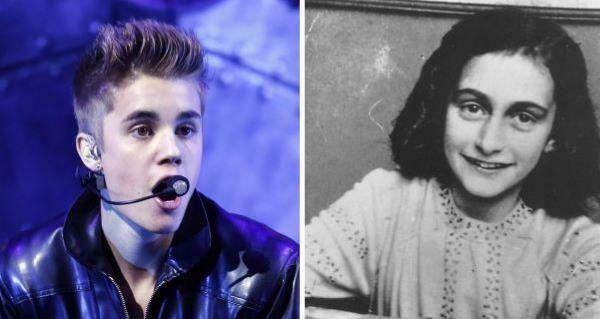 Justin Bieber's perfectly judged comment on Anne Frank - "Hopefully she would have been a belieber"
Justin Bieber has stirred up more trouble for himself with his comment in the visitor's book at the Anne Frank House in Amsterdam. I just wish I could understand why there's any controversy. Bieber wrote: "Truly inspiring to be able to come here. Anne was a great girl. Hopefully she would have been a belieber." The world has been going to town on poor lil Justin ever since. For the past few days I've seen the headlines and the tweets about Bieber's remarks. Many were outraged and others were just mocking him. I only got around to reading his actual words this morning and my reaction was, "Wow! That's actually an intelligent and thoughtful and mature comment. What's the problem?" I get the mocking - what a conceited, arrogant so and so - thanks to that last line about from Bieber that he hopes Anne Frank "would have been a belieber." I just don't think he was being arrogant or conceited at all. Bieber is 19 years old and millions of teenage and pre-teen girls world-wide absolutely adore him. He's obviously aware of that. During the years Anne Frank was writing her diary she was right in that age bracket. His comment acknowledges these facts. Bieber could have done the teenage thing and written, "How sad" and left. It would have been a perfectly judged - and empty - gesture. Words without meaning, unthinkingly scribbled down. That would have been conceited. lieber didn't do that. Although we see Bieber and his fellow teeny-boppers as cartoon characters, my guess is that Bieber was moved by his experience at the Anne Frank House. It probably struck him that Anne Frank could have, indeed should have, had the chance to be a teeny-bopper worshiping young girl. She should have had the chance to be a 'belieber.' Young girls should get the chance to be 'beliebers' rather than living in cupboards, dreading the day when the Gestapo finally discovers them and ships them off to Bergen-Belsen to meet a gruesome death. Furthermore, Bieber wasn't presumptive and arrogant despite the outrage and derision. 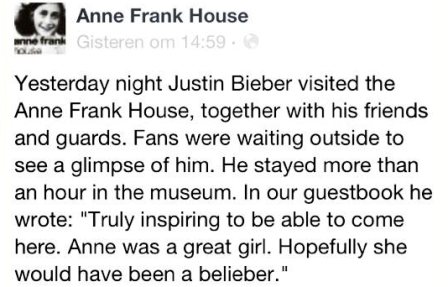 He used the word "hopefully" indicating that he didn't assume Anne Frank would have been a 'belieber,' but if she had been a 'belieber' he would have been honored. He couldn't have said it any better.